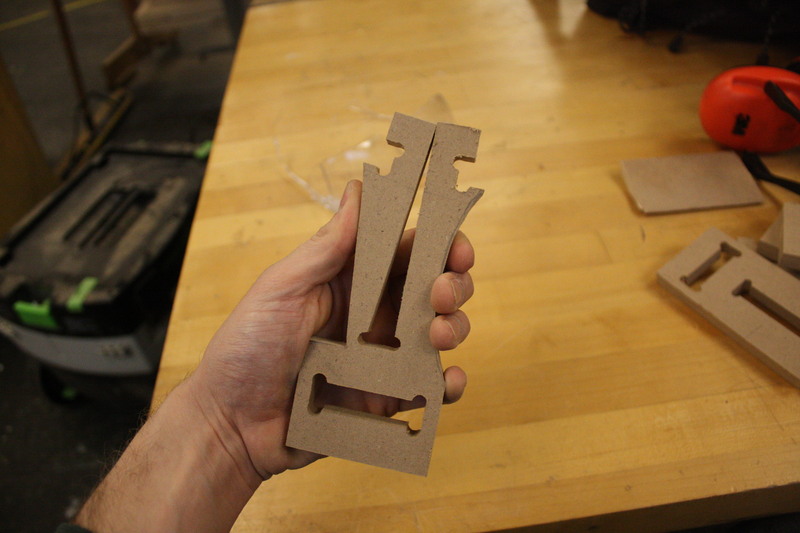 My goal for the press fit project one was to re-create a plastic snap fitting out of plywood. 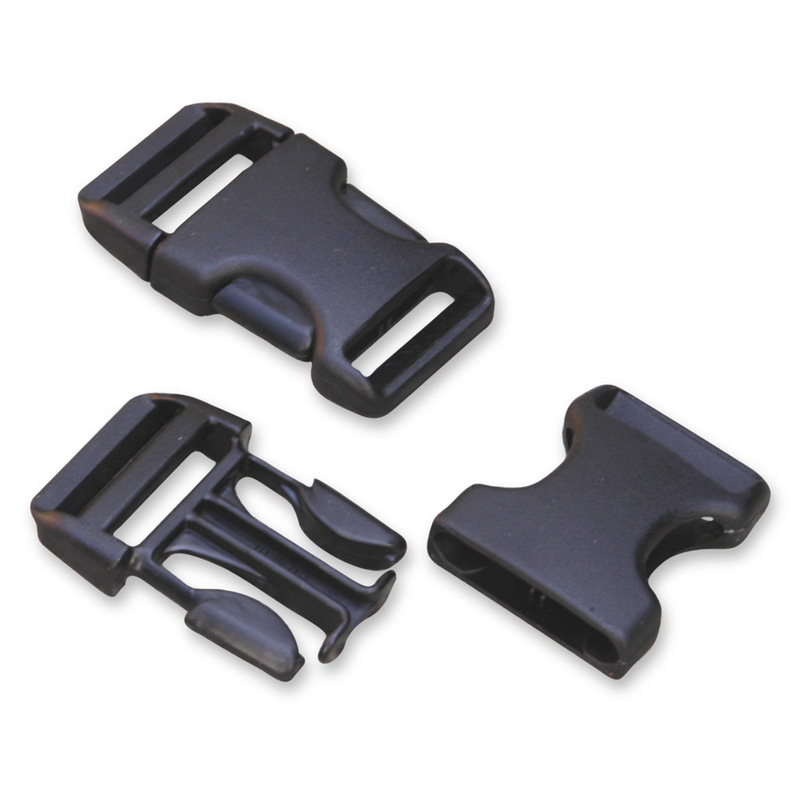 A snap fitting, like those found on backpacks and duffel bags, allows these objects to be opened, closed, and reconfigured repeatedly. 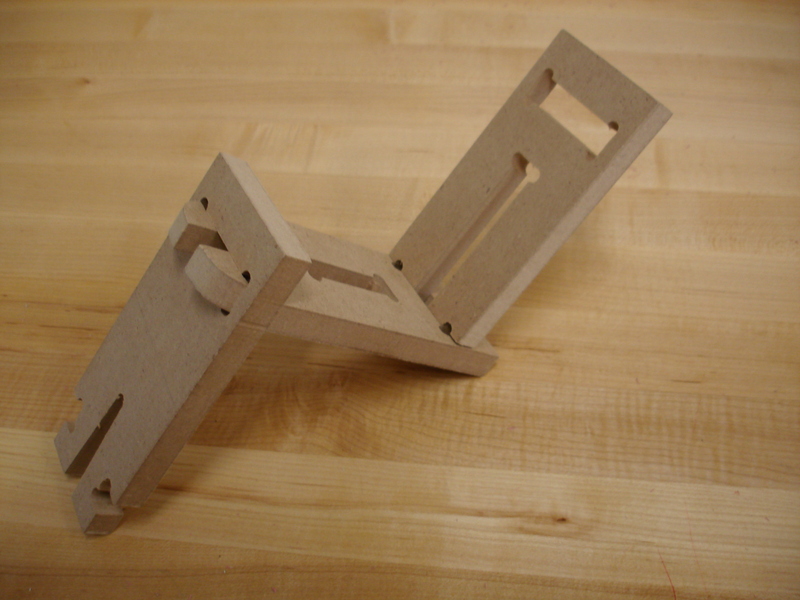 On the other hand, many traditionally press-fit designs constructed from plywood fit together snuggly to eliminate the need for additional fasteners. 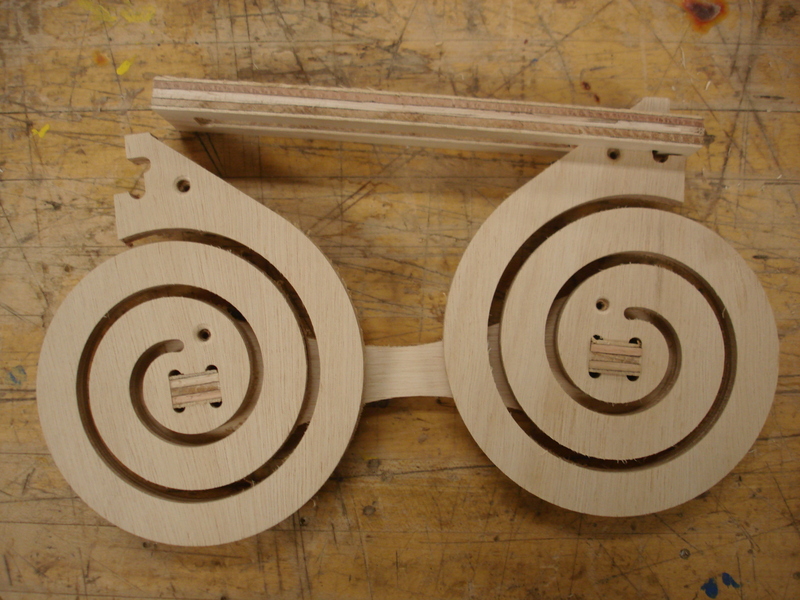 Operating between these two extremes, I sought to develop a plywood component that could realistically be disassembled without struggling to pry it apart. 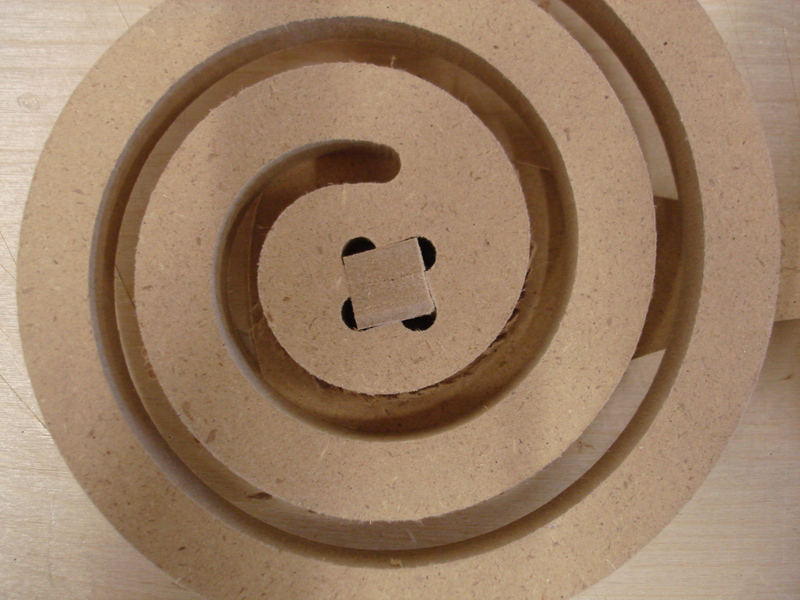 MDF snap fittings forming a chain. 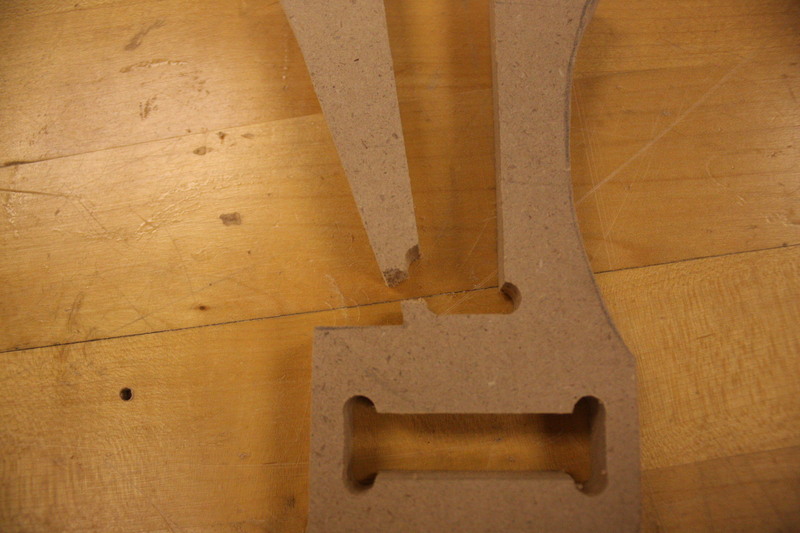 Receiving slot equal width as snap fitting head. Good for regular press fittings, bad for snap fittings. 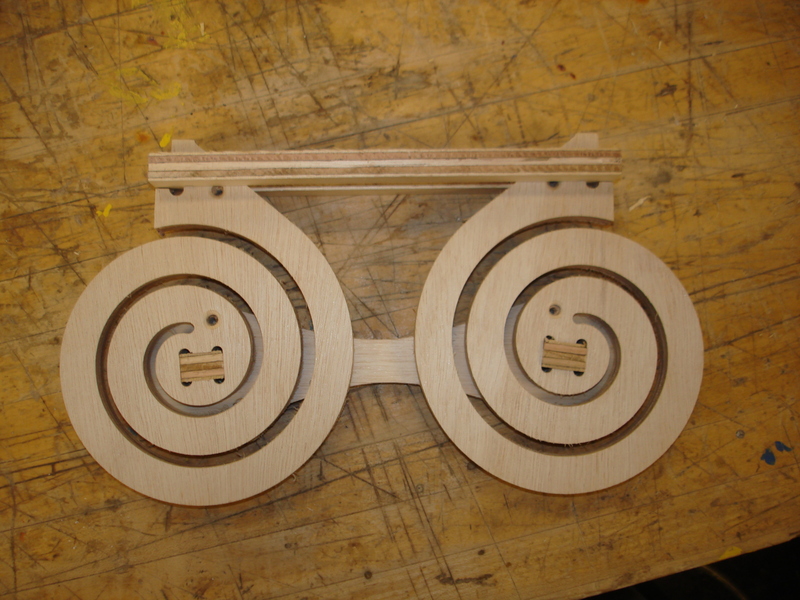 The arms of the snap fittings were too wide to flex, so I cut them down manually on the band saw. The side with the curved cut still wouldn’t flex, and the side with the angled notch cut broke the first time that I flexed it. 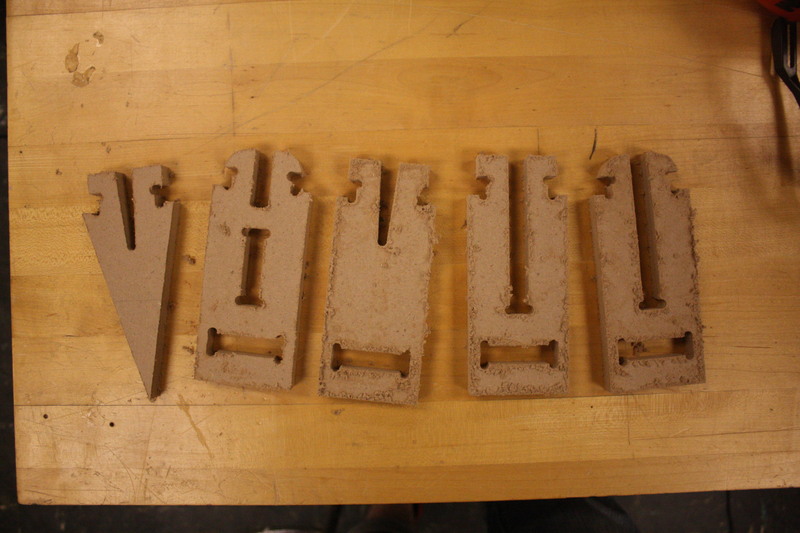 It was clear that there needed to be a ratio established between the thickness of the arm and its length. I decided to lengthen the arm in order to keep in thick enough where it wouldn’t break. 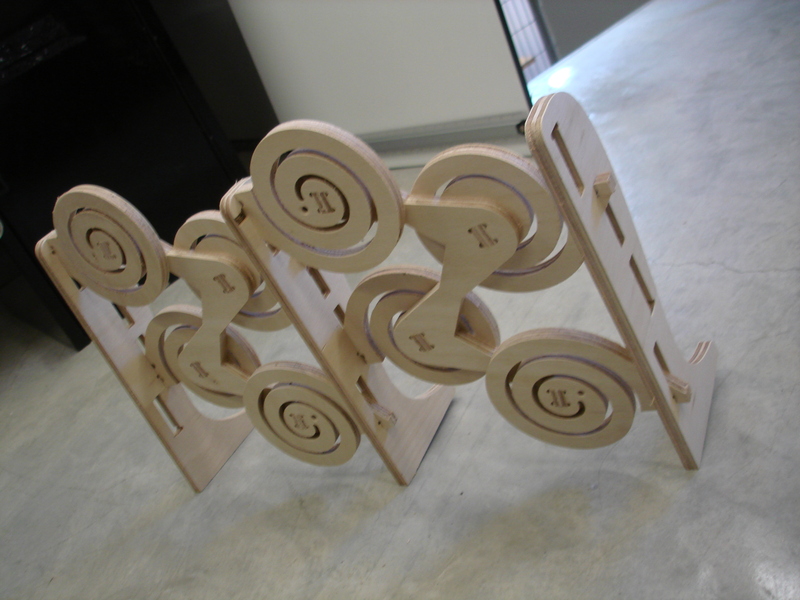 The second MDF Prototype had lengthened arms, but rather than making them straight, as with the previous version, I designed them in a spiral. 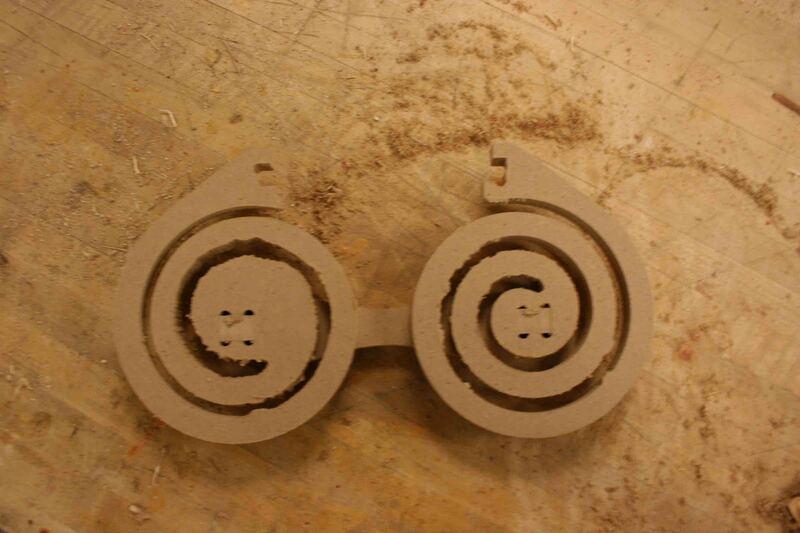 Doing so made the component more compact and reduced the rotational moment around the previous stress point. Each snap fitting consisted of two spirals that opposed each other. 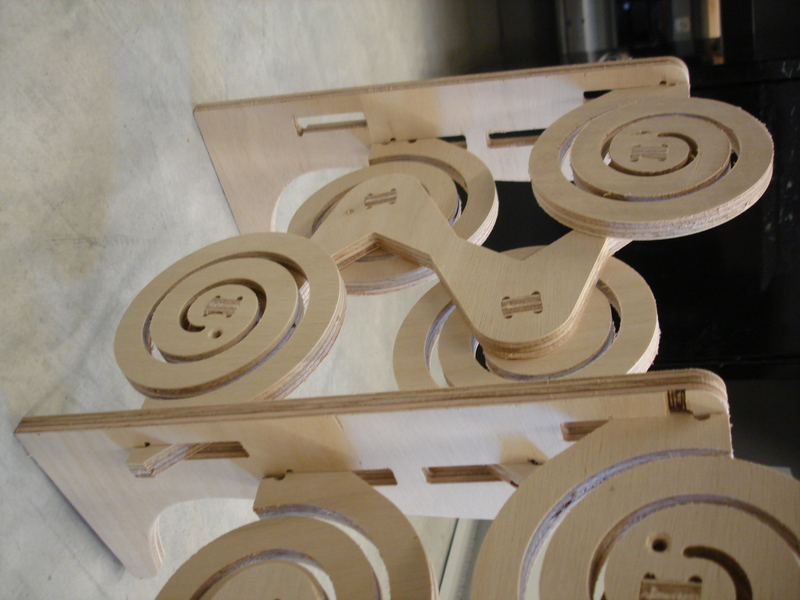 They were spaced apart using a linear member that also locked their centers in place, allowing their notched ends to flex controllably. The ends of the snap fittings slid through a slotted opening, and locked into place at either end. 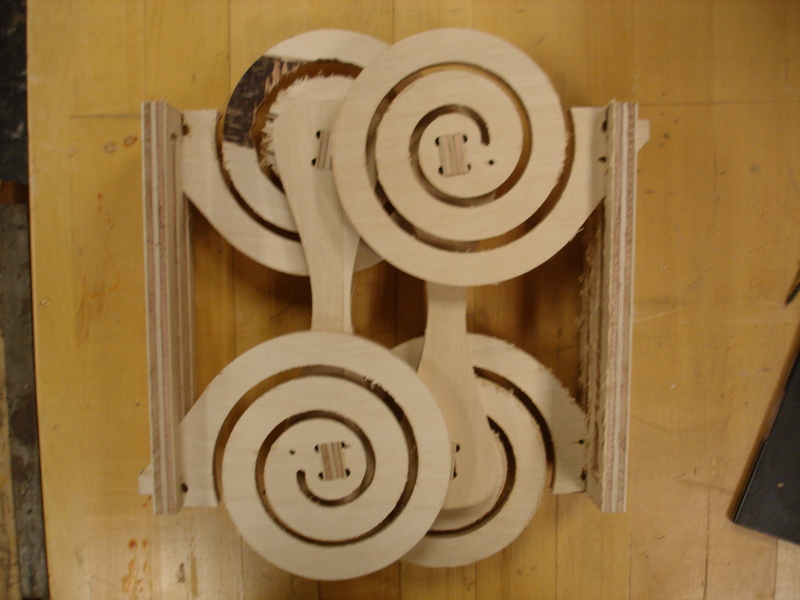 The pinwheel-type arrangement of holes that I placed at the corners of the peg slots did not proved as useful as I had hoped. 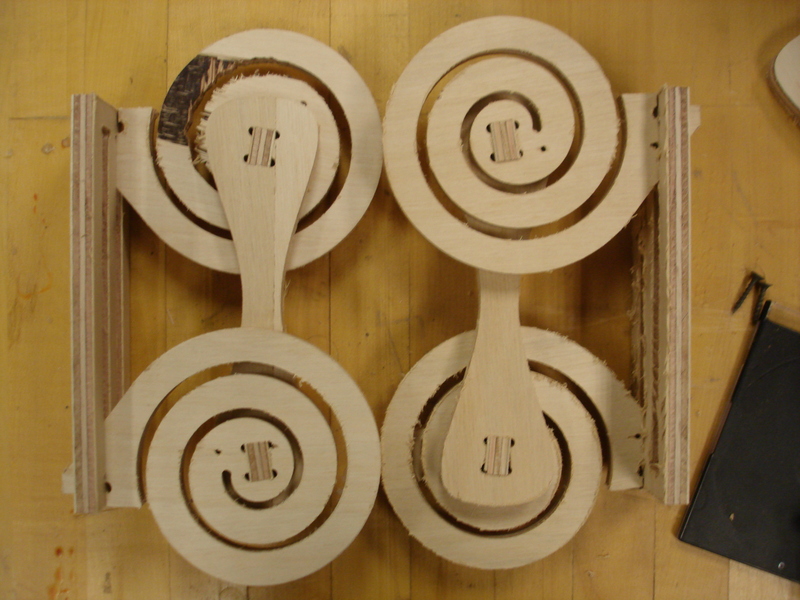 Their geometry allowed the pegs to rotate and become loose because their corners were not locked into place. Prototype showing springs, slot connector, and linear spacer. Pinwheel type connection caused too much rotation in pin. I revised the pin connection to be of an opposed dog-bone type, this yielded a really snug fit that held the spirals in place nicely. When milling the spirals this time, there was so much vibration that the end mill really chewed up one of them. 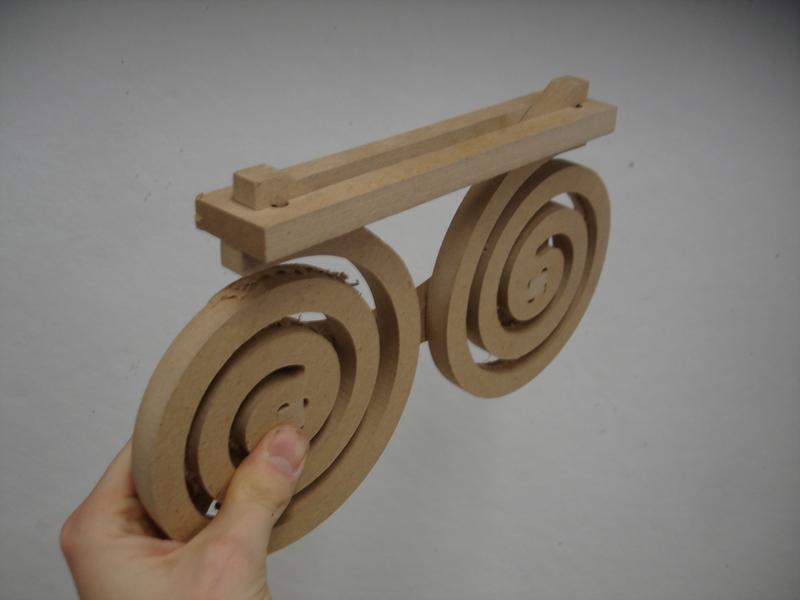 I moved into plywood and recreated my final MDF prototype. 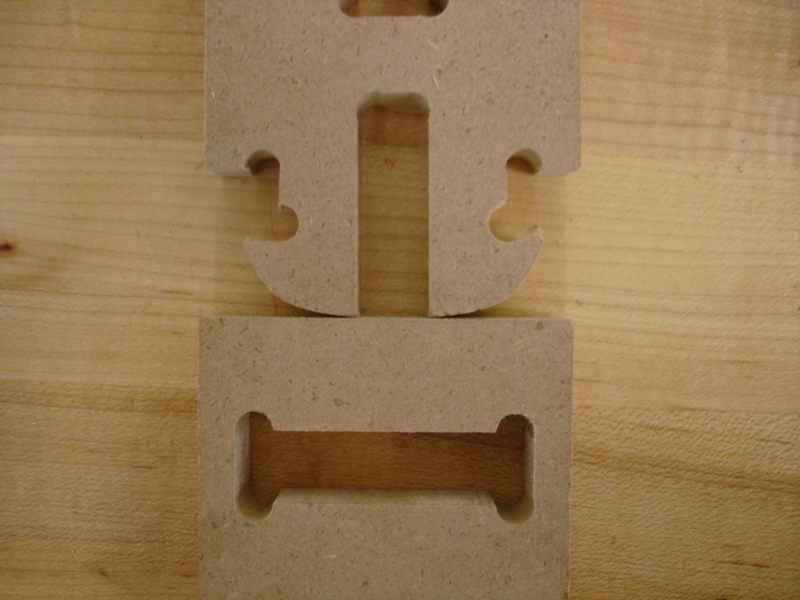 All peg holes were made 0.46″ x 0.75″ in order to accommodate the 1/2″ nominally thick plywood. 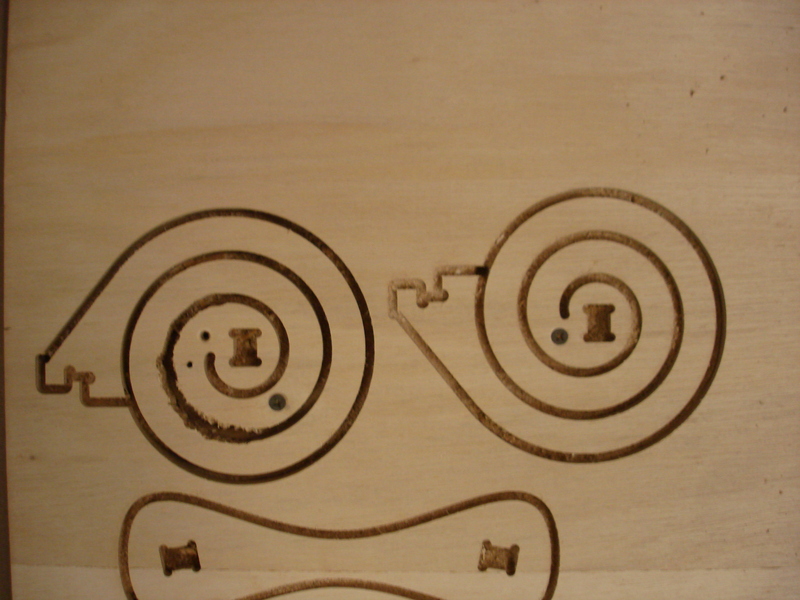 I ran the toolpath of the spiral as an engraving along a single line instead of a profile cut on two lines, cutting the milling time in half. I also angled out the pin holes to pre-load the springs. I thought that if these components could be pairs together, they might be able to form a sort of screen. 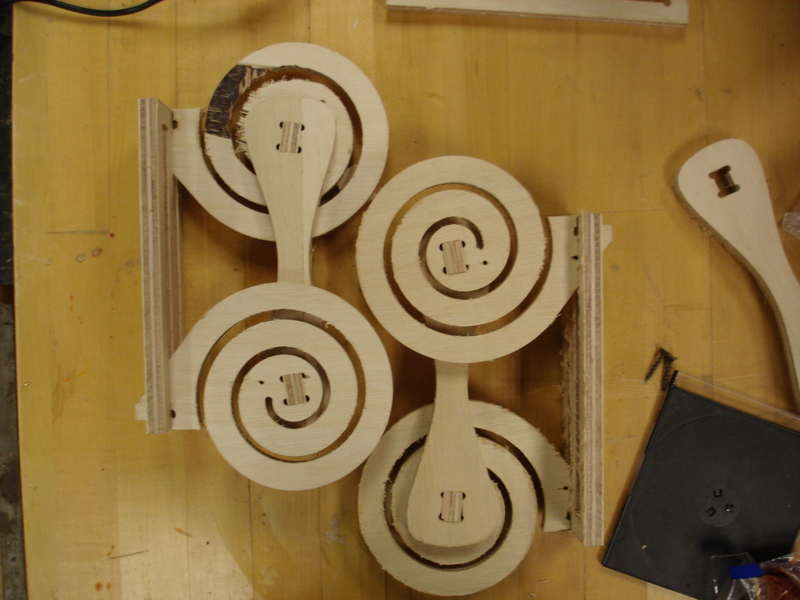 I arranged them in a few different ways before redesigned the linear connection member to zig zag between different sets of components.